The significance of this, aside from the fact that it’s an acceptance from a journal that I greatly admire, is that it came on the 11th anniversary of my mother’s death (in the Hebrew calendar, at least.) And the poem is titled “Yahrzeit.” And it is about the anniversary of my mother’s death. BPJ did not know this. The poem makes no mention of the date. I should start going to services again, I guess. 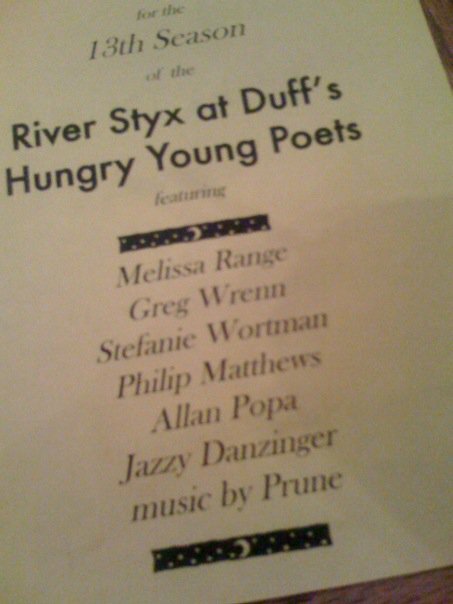 On a side note, on August 16th at 7:30 pm I’m reading at Duff’s in the Central West End as part of River Styx’s Hungry Young Poets Series. My name is misspelled on the promo flyer below, but a nice guy named Aaron (Aaron Johnson, I’m assuming?) let me know it would be a-okay for the actual event. But I’m kind of used to the “zing,” you know? Gives my name some extra kick. I might read “First Touch” for the first time out loud, unless I chicken out again. Be there. Drink. Eat. Enjoy yourself. Tags: beloit poetry journal, mom, publications, readings, river styx. Bookmark the permalink.